Muay Thai is a hard martial art from Thailand. It is similar to other Indochinese styles of kickboxing, namely pradal serey from Cambodia, tomoi from Malaysia, lethwei from Myanmar and Muay Lao from Laos. Descended from muay boran, Muay Thai is Thailand's national sport. The word muay derives from the Sanskrit mavya and Thai comes from the word Tai. Muay Thai is referred to as the "Art of Eight Limbs" or the "Science Of Eight Limbs" because it makes use of punches, kicks, elbows and knee strikes, thus using eight "points of contact", as opposed to "two points" (fists) in Western boxing and "four points" (hands and feet) used in sport-oriented martial arts. A practitioner of Muay Thai is known as a nak muay. 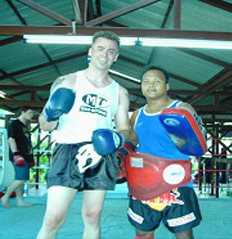 Western practitioners are sometimes called nak muay farang meaning foreign boxer. Reality SDC is a member of the Oceania Muay Thai Federation (OMTF) in Australia and the World Muay Thai Council (WMC). The Head Coach originally trained for years under the tutelage of Steve Pietsch (of J&A Fitness Academy days) and his stable of fighters and continues to do so when time permits. Steve is the former Swiss Kickboxing Champion who fought the best that the Thai's could offer in the major stadiums of Thailand. Steve is the trainer of world champions such as Paul Slowinski, Ethan Shepp, Sam Harvey and other state, national and pan pacific champions including Charles August, David Gibbs, John Chianiotis, Simon Pietsch and Danny Verusio. Reality SDC members and coaches travel regularly to Thailand to train at some of the top Muay Thai training camps. Most recently we have a great relationship with True Bee Gym in Pai, Northern Thailand. Various forms of kickboxing have long been practiced throughout mainland Southeast Asia. Based on a combination of Chinese and Indian martial arts, practitioners claim they date back two thousand years. In Thailand, Muay Thai evolved from muay boran (ancient boxing), an unarmed combat method which would probably have been used by Siamese soldiers after losing their weapons in battle. Some believe that the ancient Siamese military created Muay Thai from the weapon-based art of krabi krabong but others contend that the two were merely developed alongside each other. Krabi Krabong nevertheless was an important influence on Muay Thai as can be seen in several kicks, holds and the movements in the wai khru which have their origins in armed combat. Muay Boran, and therefore Muay Thai, was originally called dhoi muay or simply muay. As well as being a practical fighting technique for use in actual warfare, muay became a sport in which the opponents fought in front of spectators who went to watch for entertainment. These muay contests gradually became an integral part of local festivals and celebrations, especially those held at temples. It was even used as entertainment for kings. Eventually, the previously bare-fisted fighters started wearing lengths of hemp rope around their hands and forearms. This type of match was called muay kaad cheuk. The ascension of King Chulalongkorn (Rama V) to the throne in 1868 ushered in a golden age not only for muay but for the whole country of Thailand. Muay progressed greatly during the reign of Rama V as a direct result of the king's personal interest in the art. The country was at peace and muay functioned as a means of physical exercise, self-defense, recreation, and personal advancement. Masters of the art began teaching muay in training camps where students were provided with food and shelter. Trainees would be treated as one family and it was customary for students to adopt the camp's name as their own surname. Scouts would be sent by the royal family to organise matches between different camps. King Rama the VII pushed for codified rules for Muay Thai, and they were put into place. Thailand's first boxing ring was built in 1921 at Suan Kularp. Referees were introduced and rounds were now timed by clock. Fighters at the Lumpinee Boxing Stadium began wearing modern gloves during training and in boxing matches against foreigners. Rope-binding was still used in fights between Thais but after the occurrence of a death in the ring, it was decided that fighters should wear gloves and cotton coverlets over the feet and ankles. It was also around this time that the term Muay Thai became commonly used while the older form of the style was referred to as muay boran. With the success of Muay Thai in the mixed martial arts, it has become the de facto style of choice for competitive stand-up fighters. As a result, western practitioners have incorporated much more powerful hand striking techniques from boxing although some Thai purists accuse them of diluting the art.